Today, the year stretches ahead languidly. It seems so grand and broad and big sky on January 2. But I know and you know, time passes quickly. I will not be surprised by this next December. I want to be prepared. There are only 357 days until Christmas, after all. I made granola this morning as my coffee was brewing. It’s one of those things I have been making week after week for the seventeen years Dennis and I have been together. Sometimes I measure, sometimes I wing it. Cupboards open and shut. The familiarity grounds me. I have rejoined my life, already in progress. The book is behind me. It’s published. Out there. What’s next? I’m making plans. I will be on the road speaking, reading, signing books and teaching classes and (hopefully) seeing as many of you as I can. Watch for me at bookstores, farmers’ markets and excellent cooking schools (Southern Season! Central Markets! already booked!) I’ll keep the calendar up to date, so check back often. I am writing and pitching and doing those things freelance journalists do. You’ll be seeing stories here and there. For the last couple of weeks, I’ve spent time reading and researching everything under the sun; it is such a luxury after the focus of the book to do some free-range reading. Yes, I have been thinking about a “palooza” style event for preserving starting sometime in April. I am looking for sponsors and putting ideas together, so stay tuned. If you are interested in sponsoring or know a sponsor, I’d love to hear about it. Talk to me. Tell me in the comments what you think of a #PracticalPantryParty. Today, to start the new year off, a food you can stop buying and start making yourself. It’s the very essence of the Practical Pantry. A simple, satisfying, healthy granola, sweetened only with maple syrup. There’s a dash of vanilla, a whisper of cinnamon, and a good bit of kosher salt. Toast until golden and, when just out of the oven, stir in the fruit so it warms, but does not bake. The fruit remains plump and flavorful this way, not wrinkly and sad. Wishing you all a delicious New Year. Makes about a week’s worth. Store in a one liter or half-gallon jar. This is our favorite nut and fruit mix, but I’ve added hazelnuts, pistachios or walnuts from time to time. Feel free to substitute one for the other, but keep the total quantity to 3 cups of nuts and seeds and 1-1/2 cups of fruit. I would add raw coconut, but someone doesn’t like coconut. Ahem. Get the oven going to 325°F. Line a baking sheet with parchment or a Silpat. Stir the oats, nuts, olive oil, maple syrup, salt, vanilla and cinnamon together in a large bowl. Stir well until the mixture is well coated in the oil and syrup. Bake for 8 minutes. Remove and stir the oats and nuts around. Return the pan to the oven and bake an additional 7 to 9 minutes, until golden and toasty. 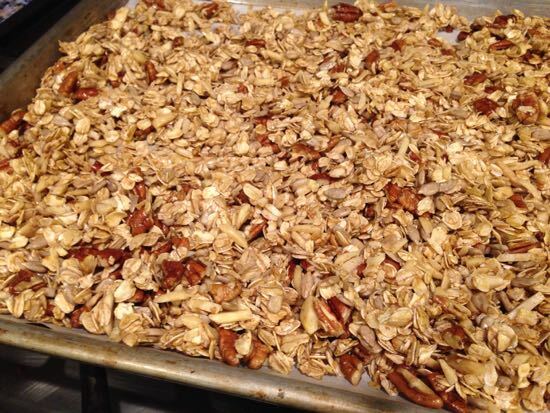 Some of the granola may turn a darker brown (but don’t let it burn). When stirred together, these more well cooked (in French, bien cuit) nuts and oats add texture and flavor. Remove the pan from the oven and immediately add the raisins and cherries. Stir well and thoroughly to both cool the granola and warm the fruit. 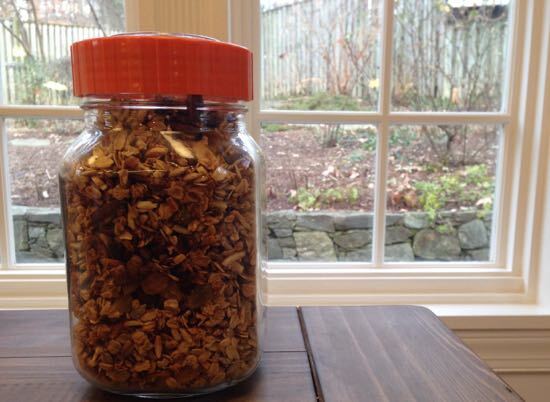 Cool the granola completely before storing in a well-sealed jar. I love trying different granola recipes! This one looks great. 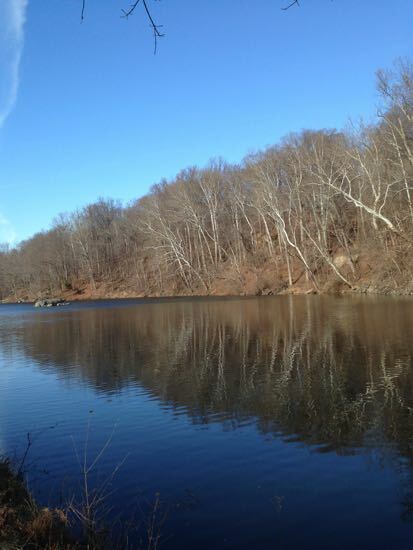 I really like your picture of the towpath! We love walking there. Oooo! A Palooooza!?!?! Oh goodie!And a #PracticalPantryParty, too? I am always ridiculously over winter by January 6, so bring it on, Spring ! Perfect 1st recipe for the first email at the 1st of the year. I only subscribed yesterday, and have this week been toying with granola. lovely. Well I read that as a #PracticalPantyParty, which I’m not up for. But since there is an R in there, I am. A Palooza and a #PracticalPantryParty Yippee!! I love the idea of a pantry-palooza party. hopefully it works here in the alaska bush. A preserving ‘palooza?!? Count me in, Cathy! W00t! Yes, Ma’am. I am ever so interested in participating in improving my pantry through your spectacular palooza! A party? Count me in! I too have been making granola for years. I could probably make it in my sleep! I love the idea of a #practicalpantryparty! #practicalpantryparty !!! – sounds like just thing to start this year off with a roar. Just pulled a batch of granola out of the oven here in Helsinki, fragrant with orange, vanilla, and ginger. Granola is a weekly staple in our house, too, and nothing makes the whole place smell better than this stuff. We also are granola makers and use olive oil and maple syrup, along with a variety of nuts, fruits and seeds. We had a frugal Christmas, which was absolutely wonderful (a trip is planned later in the year), and my gift was your book. We’ve made the samosas twice and love them (my husband was weaned on samosas; they were my craving when pregnant). A pantry party would be a wonderful thing – we aim to grow and preserve as much as we can this year. spiced smoked turkey breast. for thanksgiving.